A dental implant is the most comprehensive treatment method of tooth replacement available today. At our Red Bank cosmetic dentistry center, Dr. Michael Bixby combines experience and cutting-edge technology to produce aesthetically superior, long-lasting results for patients with missing teeth. 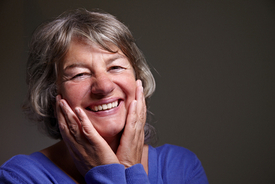 Dental implants are a detailed and permanent procedure that replaces the natural root of a tooth. Over several months, a process called osseointegration occurs, meaning the dental implant fuses with bone and gum tissues in the mouth, ensuring stability like never before. Dental implants are also versatile, and can be used to securely hold dental crowns, dentures, or dental bridges with security and a natural mouth feel. A surgically-placed dental implant supports bone and tissue structures, keeping a patient's bite properly aligned. Consultation - Before beginning the dental implant procedure, Dr. Bixby first performs a thorough assessment of a patient's oral health. This information helps to determine if dental implants are the right choice for your dental needs. During a consultation, Dr. Bixby can address any concerns or questions you have about the dental implants treatment, and suggest other treatments that may benefit in combination with implants, or as an alternative. Oral Surgery - During your oral surgery, a tiny titanium rod called a dental implant is secured in the jawbone. A temporary dental restoration is then placed on the implant. Your comfort and security are our priorities during any dental procedure, and patients should be sure to follow post-operative instructions provided by our office. Recovery and Osseointegration - Over the next few months, your new dental implants will fuse with the existing structures in your mouth and gain strength. The dental implants will support the bone like natural tooth roots, helping to prevent further tissue and structural damage. Restoration - As soon as the healing process is complete, patients return to the Michael Bixby Center for Advanced Dentistry, where a more permanent dental replacement will be fitted to your implant. Dr. Bixby will customize a natural-looking dental crown, dental bridge, or denture that will blend beautifully with your smile. In addition to dental implants, at the Michael Bixby Center for Advanced Dentistry we offer many treatments for our Red Bank restorative dentistry patients. We can restore missing and damaged teeth with our metal-free dental bridges and dental crowns. Patients who want to dramatically enhance the appearance of their smile should consider the benefits of porcelain veneers, thin shells that are bonded to the front of the teeth and cover up a wide range of smile flaws. If you're concerned about missing or damaged teeth, Dr. Bixby and our staff are ready to help you discover the many treatment options that are available to you. Please contact our Red Bank cosmetic dentistry center to learn more.